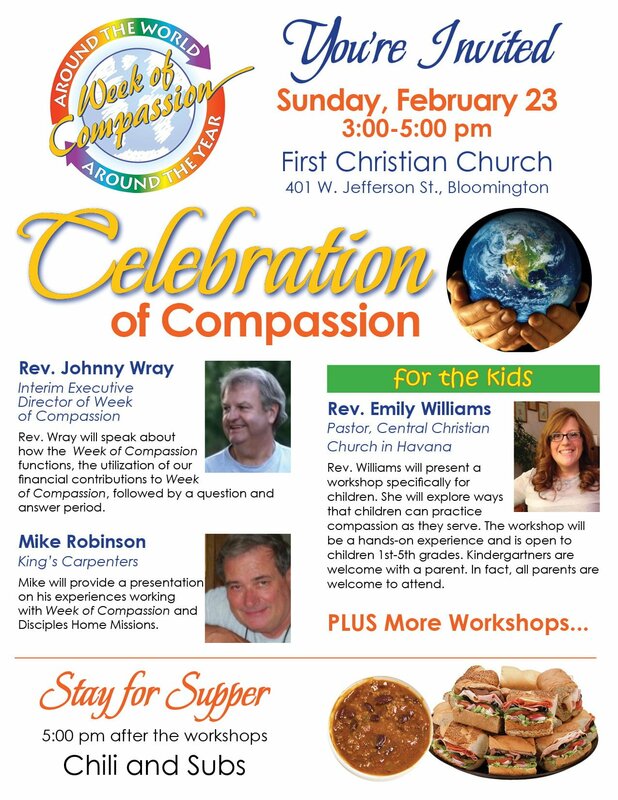 In celebration of the compassion that following Jesus calls us to, we welcome our guest, the Reverend Johnny Wray, Interim Executive Director of Week of Compassion. Rev. Wray will preach at 8:30 and 11:00 am. His message to us will center on our call to compassion and compassionate service. At 3:00 pm, Rev. Wray will speak to us about how Week of Compassion functions and how our money is spent. In addition, there will be time to ask your questions about Week of Compassion. Following Mr. Wray’s presentation, there will be workshops, for all ages, focusing on mission and service. Mike Robinson will present a workshop on his experiences working with Week of Compassion and Disciples Home Missions on behalf of his organization King’s Carpenters. The Reverend Emily Williams will present a workshop specifically for children. She will explore ways that children can practice compassion as they serve. The workshop will be a hands-on experience and is open to children 1st-5th grades. Kindergartners are welcome with a parent. In fact, all parents are welcome to attend. Stay tuned for more information about additional workshops! At 5:00 pm, there will be a chili and sub sandwich supper. Please plan to stay for dinner!